Learn the basics of music publishing today. ASCAP and BMI are here to collect money for whenever your music is used in a live performance. This can be a huge revenue stream. Educate yourself and do not miss out. Music Publishing can be a very tricky subject to understand. It is also a very important part of the music industry. If you understand it, it can be a huge money maker throughout your whole music career. The sad part is, many artists and musicians have no clue what it is. Our wonderful E-Book, "Understanding Music Publishing", can help you get an understanding of how music publishing works, and how it can make you money. This book was put together by industry vets with over 15 years experience in the music industry. This E-book will truly help you get a grasp on how it all works. The music business is just that.....a business, so in order to make it, you need to be knowledgeable about music publishing. Read this E-book on your computer, iPad, iPhone, iPod Touch, and Kindle devices. Buy this E-Book now for only $10.99. Take advantage of this sale today. Be sure to check out our other E-Books for musicians by clicking the link at the top of the page. Wait One Minute! How about this deal? Learn all you can about the music business! Instead of just getting the contract template pack, get even more with it! Yes! Get the following in this download pack! This wonderful book teaches you how to release your own music. Everything from recording to the release party. Perfect for independent musicians. Includes a sample music business plan, bio, and one sheet. Do not pass this up! 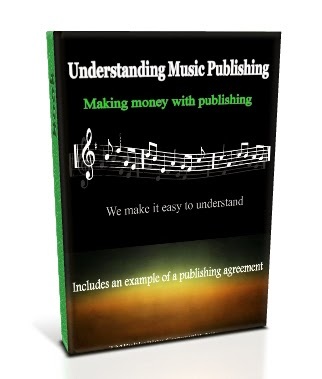 This wonderful book will teach you the basics on how music publishing works, ways to make money with music publishing, how to start a publishing company, and more. Included is an example of a music publishing contract. This book has all the contacts you need. Dealing with other artists, record labels, managers, and clubs is a situation where you should have a contract ready. This will ensure good business on both ends of the agreement. Of course having a good entertainment lawyer is a must too. Yet, many indie artists will draw up their own contracts for simple deals. Sound effects are an important part of recording in music, movies, games, and more. It is nice to have them on hand for whenever you need a specific sound to use in a recording. This is perfect for producers who need sound effects for use in songs, skits and more. This is a must have effects pack. Download our sound effect pack today and get over 100 sound effects in all. Get all of these E-Books & the Sound Effects Pack now. Read these E-books on your computer, iPad, iPhone, iPod Touch, and Kindle devices. Buy all of these E-Books now for only $43.00. This book was really helpful. To the point on such a confusing subject. I love the help this book has given me. The sample contract is a plus. I have learned so much. Thanks for writing this book. Just read it on my ipad. Good read. Will go back to it. Awesome ebook. I learned some new things. Publishing has been confusing, this helped with it's basic info. 2Pac Of GoodNews Gospel Rap Music. King1Rev has return wit 2NEW song to hear 2Pac instrumental "Hail Mary" click on song "Jesus Chrissst" & To hear 2Pac Instrumental "Shed So Many Tears" click on song "15years" Listen@ http://www.reverbnation.com/1Revsconie U Gotta Hear Tis! Good EBook. Good information. I was pleased. I feel like the information was great however it wasn’t what I was looking for. I want information i did not already know. Copyright 2019 Hardcorejamz.com. Awesome Inc. theme. Powered by Blogger.